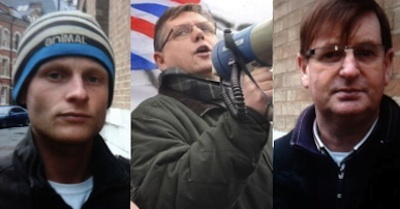 Jamie Bryson, Willie Frazer and Jim Dowson were arrested separately in the past 48 hours. Frazer has now been charged with public order offences, while the other two are still being questioned. Both Bryson and Frazer are leading members of the Ulster People’s Forum, the new group most often linked to the protests, while Dowson has until recently served as a leading figure in the ultra-right British National Party. In a bizarre sequence of events, the PSNI said it had detained Bryson on Wednesday morning before admitting he was ‘not at home’ when they sought him. The baby-faced provocateur later declared himself at liberty in a video he posted on the internet. He goaded the “fascist” PSNI over their failure to successfully track his movements, and declared himself a victim of civil rights abuses. The 22-year-old said he had considered handing himself in but had been hampered because “my leg is very sore”, although later said he would not. “How much money is [PSNI chief Matt Baggott] spending chasing me? He needs to employ better tracking devices,” he said. The arrest of Frazer was not straightforward either. A colleague of the loyalist lobbyist said he had confusingly identified himself to the PSNI as a named republican and had ‘confessed’ to sectarian killings. After his house was searched, Mr Frazer was charged with public order offences and possession of a Tazer stun gun. Loyalists had protested outside Musgrave Police Station in central Belfast where they said Frazer was being questioned. They vowed to continue with their three-month long campaign, despite recent moves by the PSNI to enforce the law in regard to illegal roadblocks and parades. Frazer was remanded without bail. It is not yet known how the recent arrests will affect the weekly flags demonstration at Belfast City Hall, which is due to take place tomorrow. Bryson and Dowson, a leading figure in the ultra-right British National Party, are are currently being questioned in regard to public order offences. The PSNI were reported to have flooded the streets of the seaside town of Bangor, County Down on Thursday in an attempt to capture Bryson. He had evaded arrest and spent much of the day revelling in the embarrassment the cat-and-mouse game had caused police. He claimed PSNI Chief Matt Baggott was “a puppet” of Sinn Féin’s Gerry Kelly, telling his fellow loyalists the operation was “despicable” and a “disgrace”. Bryson was referring to a statement by Mr Kelly this week in which he said he had held a “frank” discussion with Matt Baggott on the illegal parades. The Sinn Féin policing spokesperson acted after the head of the Parades Commission insisted the PSNI was responsible for enforcing the law on unnotified parades or protest marches. Last Saturday saw the nationalist Short Strand enclave in east Belfast again blocked off as a loyalist mob took part in another illegal parade from east Belfast to the city centre protest. Loyalists have marched past the area every Saturday since the flags dispute began in early December, in diminishing numbers. A second protest outside PSNI headquarters in east Belfast on Saturday, organised by Bryson, attracted just 30 people. SDLP Policing Board member Conall McDevitt said policing of the flags crisis has been characterised by “tactical mistakes since day one”. Sinn Féin’s Alex Maskey said the situation had gone “beyond farcical”.